When disaster strikes, it’s never easy on the homeowner. Unfortunately, disaster can strike your home in many different ways, including fire, flooding, and even mould damage. But no matter what your disaster is, Paul Davis is here to help get everything in your home restored back to normal, making it feel like home again. In fact, that’s our entire business. That being said, there are a lot of scammers out there. Many vulnerable homeowners are taken advantage of after big disasters like storms or flooding by people out to make a quick buck. So we always encourage homeowners to do thorough research on a company before hiring them—especially if it’s someone who knocked on your door following a disaster. Of course, despite the best efforts of homeowners, they can still sometimes fall into the hands of a dishonest contractor — and that’s something we hate to see. 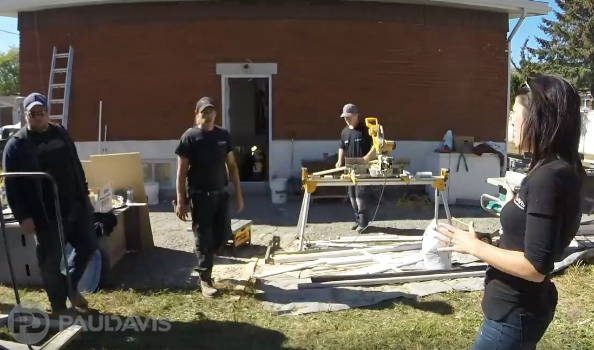 Which is why on September 30, 2017, 69-year-old Colette Martel, who lives near Montreal, was surprised to find that the Longueuil Police Brotherhood and Paul Davis franchises, along with an army of volunteer workers, stormed her house for the weekend to carry out renovations that had not been made by an alleged fraudster. When disaster struck, Colette reached an agreement with a contractor she thought was legitimate. Unfortunately, the contractor ended up stealing over $90,000 and left her with a house in complete disarray. This was upsetting on a number of levels. After all, who likes living in what feels like a construction zone? Imagine that feeling—and realizing that you have no real way out of it. You’ve spent all of your money on a contractor you expected to get a job done—but they left you high and dry. Now you have no money, no materials, and no way to complete the work. What do you do? In Colette’s case, the co-owner of Paul Davis Saint-Hyacinthe, Véronique St-Pierre, spearheaded Colette’s project with the lead detective in her case. Véronique rallied other Paul Davis franchisees, and soon the Montreal and Sud-Ouest offices joined the ranks of helpers. These franchisees donated money, supplied tools and provided a whole lot of manpower, managing to complete the impossible in just two days. This is an excellent example of how Paul Davis works to apply our vision to our work. We aim to provide extraordinary care while serving people in their time of need. To see a time lapse video of Colette’s project, visit Facebook. And remember, when disaster strikes, call the experts at Paul Davis. This is No Time For Second Best®.